Born January 17, 1964 to Frasier Robinson, a pump operator for the city of Chicago’s water plant, and Marian Robinson, who spent much of Michelle’s childhood a homemaker, Michelle grew up on Chicago, Illinois‘ South Side, one of the nation’s poorest urban communities. Her parents strictly limited their children’s television viewing, and Michelle and her brother Craig were expected to take part in discussions around the family dinner table. Since 1996, she has been associated with the University of Chicago, first as associate dean of student services, and in 2005 becoming vice president for community and external affairs at the University of Chicago’s Medical Center, as well as managing the business diversity program. She has worked to bridge the gap between the University and the residents of the surrounding disadvantaged neighborhood, focusing on the opening of neighborhood medical clinics. In January 2008 she took a leave of absence to concentrate on the demands of the Presidential race of her husband. Essence magazine in May 2006 as one of “25 of the World’s Most Inspiring Women.” Oprah Winfrey included her as one of the “young uns” honored at Winfrey’s 2006 Legends Ball. She has described herself as “too impatient” for a political career of her own, but with her husband’s Presidency, her intelligence, wit, and passion have a national if not worldwide platform. 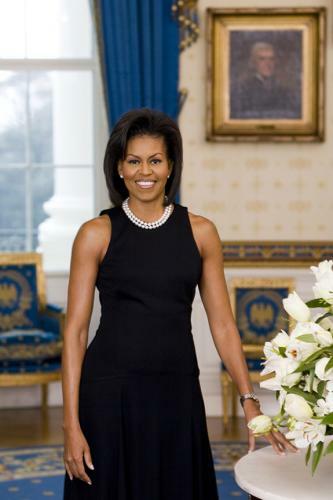 Liza Mundy, Michelle, a Biography (New York: Simon & Schuster, 2008); Michelle Obama in Her Own Words, the Speeches 2008, compiled by Susan A. Jones; David Colbert, Michelle Obama, an American Story (New York: Houghton Mifflin Harcourt, 2009); David Bergen Brophy, Michelle Obama: Meet the First Lady (New York: Harper Collins, 2009); Elizabeth Lightfoot, Michelle Obama, First Lady of Hope (Guilford, Connecticut: the Lyons Press, 2009) and Barack Obama, The Audacity of Hope (New York: Crown Publishers, 2006); www.barackobama.com/about/michelle_obama.